France's Autolib car-sharing service collapsed this year. 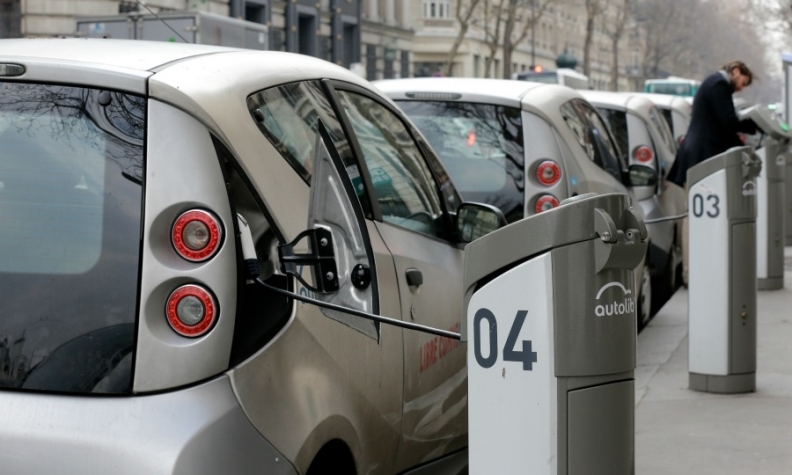 PARIS -- Seven years ago, French billionaire Vincent Bollore started one of the world's first electric car-sharing services, deploying thousands of gray hatchbacks across Paris and drawing in more than 150,000 subscribers for trips around the city. Now, amid widening losses and criticism that the vehicles are poorly maintained and dirty, Autolib has emerged as a political hot potato for Mayor Anne Hidalgo, who is considering an early termination of his contract with the city. The controversy over municipal backing of the unprofitable service is shaping up as another headache for Bollore, who has suffered a string of recent setbacks across his business empire. The company's struggles in the French capital come just as the car-sharing sector is emerging as one of the hottest in the automotive industry. Some of the world's leading manufacturers like General Motors, BMW and Daimler are entering a business that will help transform vehicle ownership. On Monday, city officials met with a host of automakers that have expressed interest in replacing Autolib, including Renault, PSA Group, BMW and Daimler. A spokeswoman for Peugeot and Citroen brand owner PSA said the company's interest will depend on the terms, while Renault declined to comment. Representatives for the German automakers could not provide immediate comment. "We want to maximize the usefulness of this service for Parisians while making sure it's not too costly for taxpayers," Paris Deputy Mayor Jean-Louis Missika said. "We're interested in hearing from the automakers who say they can provide the service without subsidies -- and are actually doing it already in other cities." The dispute over Autolib centers around its losses. The company has asked Paris and suburbs to cover a projected 46 million-euro ($54 million) annual deficit until the 12-year contract expires in 2023, Le Monde reported last month. Missika called the request "excessive." For its part, Autolib has agreed to cover 60 million euros in total losses, while the cumulative projection has ballooned to 300 million euros by 2023. The request for funds prompted Paris to scout for other partners, although Missika said the actual termination of Bollore's contract isn't currently on the agenda. A forced exit would deal a blow to expansion to other cities. The Paris service helped Bollore win orders and public subsidies in Los Angeles, Indianapolis, Turin and Singapore for its services. Bad press surrounding Autolib is the latest in a string of public and personal setbacks for Bollore. The businessman was charged in April by French investigators as part of a bribery probe in two African countries. The same month, he lost his boardroom grip on Telecom Italia. He's also given up on a plan to buy a video game company, and the pay-television channel of French media group Vivendi, in which Bollore SA has a stake, lost its three-decade hold on the broadcasting rights to French soccer. Autolib's losses stem in part from the operational challenge of constantly moving cars from inner Paris, where drivers often leave them, to the 100 Parisian suburbs that are part of the Autolib network. The service is also suffering from competition from taxi services like Uber and -- more than anything -- the city's dense public transport network that reduces the need for vehicles. In 2011, when Bollore started the service, he predicted it would be profitable by this year. "Autolib is a technological and political success, but an economic failure," Nicolas Louvet, head of consultancy 6t, said by phone. "It's not because it's possible, that it's useful. The core issue is that there was no real need for Autolib in Paris." In an interview with newspaper Les Echos, Hidalgo raised the possibility of terminating Bollore's contract before 2023 to opt for another system under which cars wouldn't need to park at fixed spots. Autolib vehicles must be plugged in all night to protect their batteries, a system that has so far failed to attract individual buyers. Figures from the French industry group CCFA show Bollore sold one passenger car in April in France. In Madrid, PSA's joint-venture Emov has more than 180,000 subscribers who can rent electric Citroen C-Zero models by the minute. BMW and Daimler this year combined their car-sharing operations Car2Go and DriveNow. Autolib was set up as the vehicle version of Paris's public bike-sharing service Velib, which is struggling after the city picked a new company to operate it. With Autolib, Hidalgo is facing the added pressure of elections in two years. "It could be risky for the city to pick a contender and get a new service running by then," Louvet said.